And if you want to become a subscriber, you'll be the first to know whenever we add new videos! Just look for the golden yellow Subscribe button to the right of the videos at YouTube. If you are choosing a veterinarian there are several things you’ll need to assess concerning your potential vet’s overall attitude toward animals and approach to health care . . . . . If you want to view some really nice pieces of German Shepherd Dog Art, then you're in the right place. Many of these a unique and done in various media. Enjoy looking at each of these wonderful and affordable works of art . . .
Watch my girls play with their favorite toy of all time - a Jolly Ball. . . .
German Shepherd tail carriage is very indicative of many things such as its current social standing or mental state. 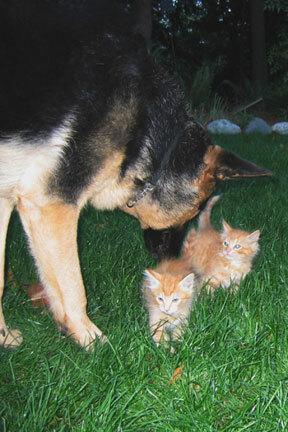 Read on to learn even more about GSD tail positions and their meanings. . . .
German Shepherd cataracts can occur as a result of various diseases, toxicity, trauma or metabolic disturbances and they can also be inherited. . . .